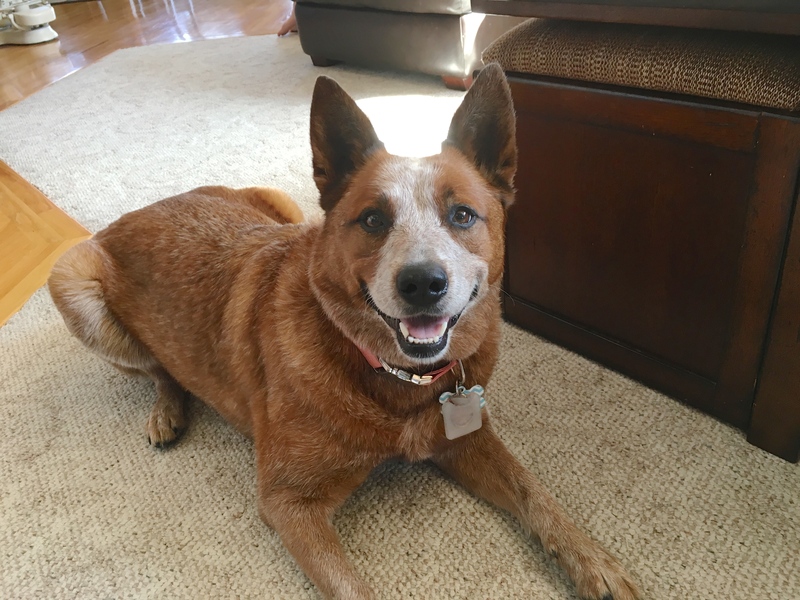 Minka is a five-year-old Red Heeler who likes to jump up or climb on her guardians, is anxious in the car and dog aggressive. She did very well on the greeting; inquisitive with a nice balanced energy. She didn’t jump up and while she got really close to give me a deep sniff, she was respectful of my personal space. A great start. Usually the behavior and energy level the dog shows at the door is a good barometer for the rest of the session. While Minka started off calm and with nice respect for personal space, shortly after I sat down with her guardians, I got a clear picture of the root source of her behavioral issues. Climbing up on a siting human can be an indicator of a dog that does not have the proper level of respect for them as an authority figure. Additionally the higher a dog sits, the most rank or status they think they have. I asked a few questions to determine how much discipline or structure Minka was exposed to. Often dogs that are reactive or show little self control come from homes where there are no rules, boundaries or limits. One of the two ways that dogs learn is called Operant Conditioning. In a nutshell, the dog does something and based on their actions, something else happens. Lets say your dog comes over and jumps up on you. In response you may disagree or correct the dog. But when that same dog was a puppy, it would come over to you and jump up on you. At which point you petted the dog because it was so darn cute. Well basically you conditioned your dog that the proper way to get your attention is to jump up on you. This is why its so important to pay attention to how we interact with dogs; both when correcting and when rewarding. The guardian had already started practicing my Petting with a Purpose methodology and was starting to see results. I made a few other suggestions for rules, boundaries and limits they can add. By consistently enforcing these rules, her guardians will assume more of a leadership position in the dog’s eyes. Over time this helps shape the leader follower dynamic so that the dog identifies as being in a follower position. Because the dog was always right next to the humans in the home, especially the family’s mother, I showed her how to claim her personals space in a way the dog understands. Mina’s guardian was a bit surprised at the dog’s barking. She said the dog never behaved that way as I guided her through claiming her space. This barking was Minka’s way of protesting the change. Basically we are demoting the dog and changing how it sees itself so that it identifies as having less authority than the humans. This change is paramount for Minka as her guardians rehabilitate her. By the end of the session, Minka was showing respect for her guardian’s personals space, was already following the new rules and checking in visually with her guardians from time to time. Its going to take consistent enforcement of the new rules and structure, petting with a purpose and timely corrections for unwanted behaviors before Minka adopts this follower persona completely. Bt once that is the case, most of her unwanted behaviors should stop.